Back to School: Carmex #Giveaway CLOSED!! I have a confession to make, I have a addiction to lip balm. I have quite a collection and I always have at least four different kinds in my purse at all times. I also have them stashed around my house, in drawers, jewelry boxes, and make up bags. I have a pencil case in my undergarment drawer that has several lip balms in it. One brand that I just love is Carmex. I have several little jars and some tubes as well in my different stash spots. So when I was sent some of the new Carmex sticks, I was very excited to add some new lip balms to my collection!! I was not just sent some new lip balm sticks, I was also sent a really neat blanket as well. This blanket is perfect for our little picnic’s we have with the kids at the park!! 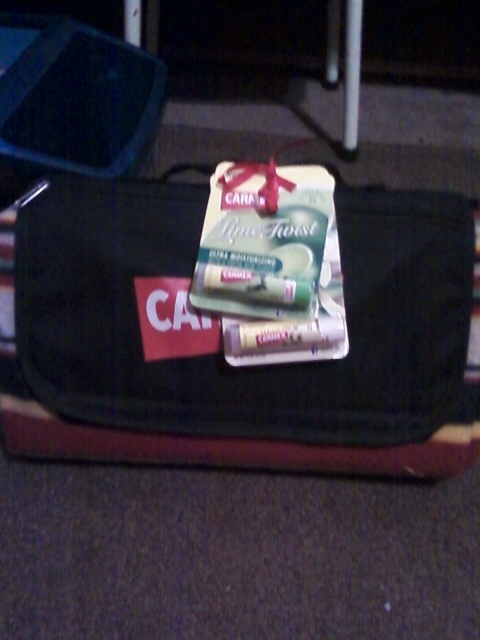 The lip balms I received were the new Carmex Lime Twist click stick and the Carmex Vanilla click stick. I love a good smelling lip balm and I just love both of these new flavors!! I love to put some lip balm on and smell a really good balm, and I could just sit and continue to add the Carmex Lime Twist to my lips, it is just that yummy smelling!! Both of these lip balms are perfect for when I am out playing since they both have SPF 15 in them. These are also going to come in handy when the cold weather comes around because that is when I tend to use the most lip balm!!! Well the wonderful people from Carmex would like to give one of my amazing readers the same gift pack they sent me!! Tell me which of the Carmex products you like best!! Please leave your email with this entry!! This giveaway is open to US residents. This giveaway will end at 11:59 pm on August 29 ,2011. Winner will be chosen at random.org and will be given 48 hours before another winner will be chosen. All products for reviews and giveaways are given as a sample from the companies. All opinions in reviews I conduct are my own. I was not paid to say anything or review any products. Next Post Back to School: AT&T Smartphone #Giveaway CLOSED!!! I like the vanilla best. email in profile.